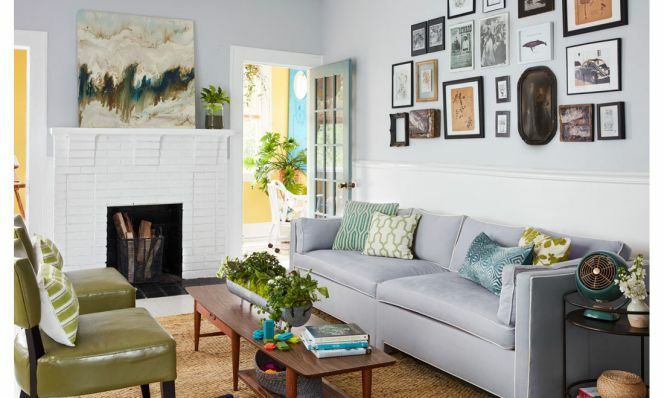 Meet a creative couple who used elbow grease, artwork and botanical touches to totally transform their Savannah fixer-upper. It takes a lot of confidence—and a good eye—to make an offer on a house you’ve seen only online. But when something feels right, you just know. 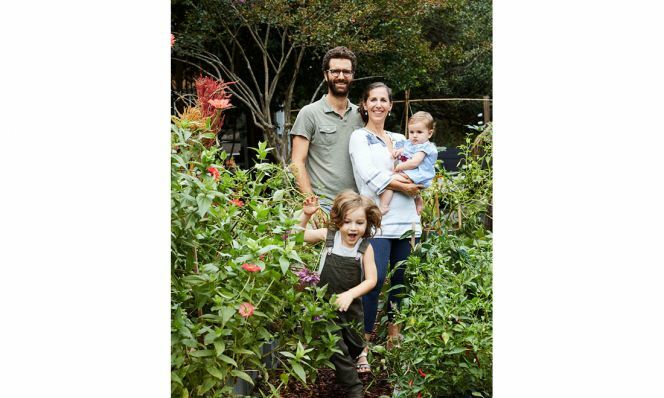 Anissa Manzo Goeken, founder of a botanical boutique and wedding design studio called Urban Poppy, and her husband Russell Goeken, a photographer, were actually living overseas when they bought their small 1910 Federal-style brick home. They could tell from the listing that work was needed, but they also saw lots of potential and were ready to roll up their sleeves. “Russ and I DIYed it all,” says Anissa. They knocked down walls, ripped out carpets and painted the hardwood floors white (which some people found shocking) to give the place a more Danish-modern feel. The end result? A just-right oasis for themselves and their kids, 4-year-old Sebastian and 16-month-old Sabine. To create a clean canvas, the couple painted the walls and fireplace the palest gray and white; Russell added wainscoting for detail. Vintage family photos, plus the couple’s own artwork, drawings and photography, pull the living room together. The couch was a $100 Goodwill find that was ripe for reupholstering. As for the midcentury modern original Lane coffee table, that’s a thrift win as well. “I paid $90 but it’s worth around $1,600, I believe,” says Anissa. “Woo-hoo!” The natural fiber rug and other doctored-up Goodwill discoveries—frames and bamboo trays painted high-gloss black—complete the eclectic hodgepodge. → Look for furniture with good bones. Even if a chair or couch appears a little beat up, it can always be painted or reupholstered. 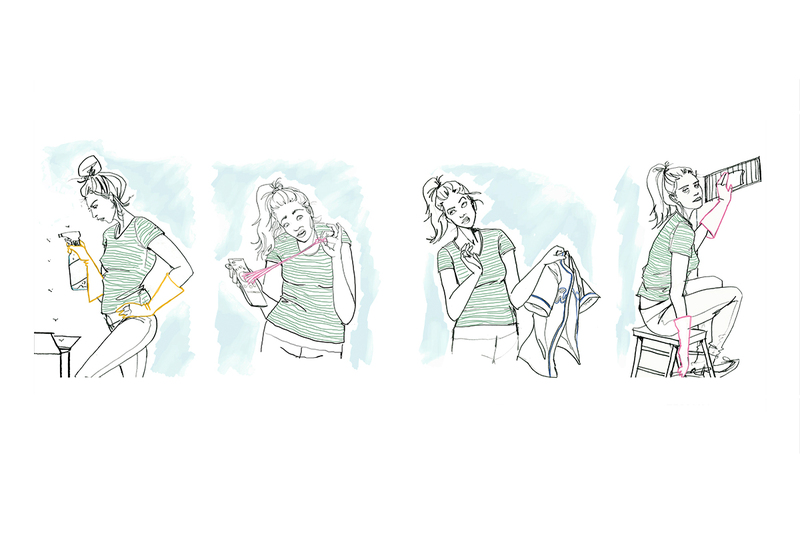 → Keep a small tape measure on hand to verify whether something that catches your eye is right for your space size-wise. → Fine-tune your vision. Oftentimes one key piece can set the mood for an entire space. → Always haggle, politely of course! Russ knocked out a wall to create a breakfast bar and laid down aluminum flashing for the countertop. “Wall cabinets can take up tons of real estate,” says Anissa, “so instead we put in floating white shelves and placed all our pantry items in clear glass jars.” The couple baked in light touches like bamboo blinds, wicker storage baskets and a white pendant lamp. Georgia-based floral designer Anissa Manzo Goeken and her husband Russell Goeken zeroed in on this tiny sunroom to double as a combination studio/office. 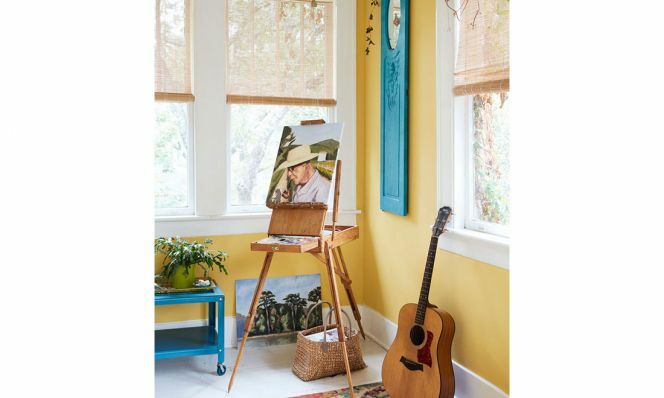 They painted the walls a buttery yellow and now consider it the cheeriest room in the house. Here, as elsewhere, they removed existing carpets, painted the floor and added wall hangings and plants. A giant peony painting brings a floral design element to the dining room and creates a striking counterpoint to a dark wood Balinese dining table and mod white chairs from IKEA. The antique table runner was purchased some time ago in West Africa. A red buffet side table, cheerful printed curtains and fresh flowers up the happy. “Like many of my contemporary floral designers, I’m primarily self-taught,” says Anissa. “My mother and grandmother were both avid gardeners and passed that down to me.” So although she grew up in New York City, she was fortunate enough to be exposed to flowers and brought all of that to their Savannah garden. Russell, a Texas native, developed a passion working on his family’s farm early on. They realized they wanted urban homesteading to be a bigger part of their life, which led to keeping chickens and quail. For Sebastian’s space, Russell put wainscoting and beadboard all around the room to keep with a light, beachy vibe. Anissa converted an old shell wind chime she found at a junk shop into a chandelier using a simple DIY lighting kit from IKEA. 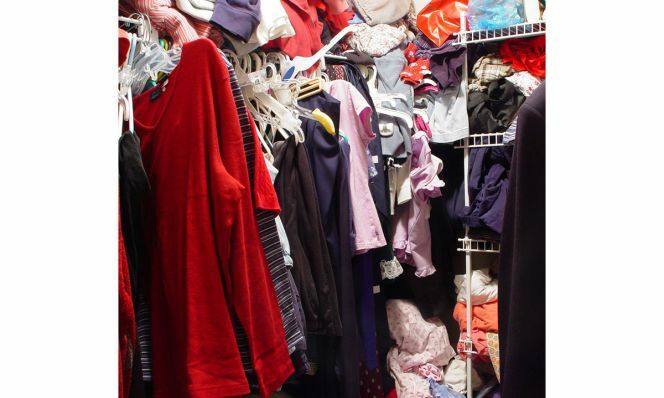 Sebastian’s clothes are stored in shelving with baskets, giving him easy access to his things. Unique details like a cool map, framed fabric for instant art and a stool that Anissa “yarn bombed” give the room a playful, personalized touch. The stool was originally part of an art installation, suspended from a wall full of bright flowers. “Old historic homes definitely weren’t designed for us modern Americans and all our stuff!” says Anissa. When the couple decided to open up the hallway to enlarge their galley kitchen and create a more open plan, it meant sacrificing a linen closet. Their fix: retrofit an alcove to provide extra storage. 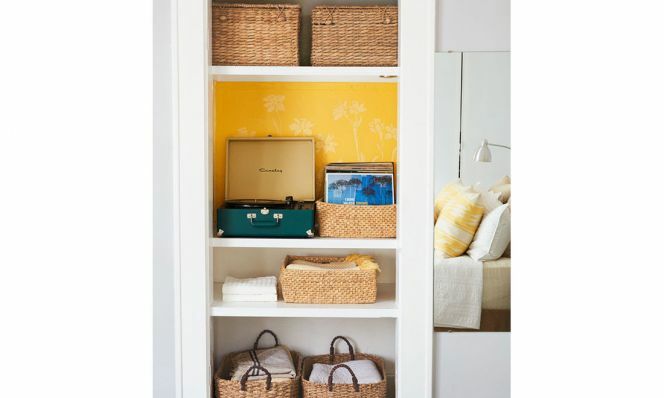 Shelves help, as do a variety of both lidded and open baskets that house extra linens and a cherished collection of record albums.